He calls it “situational photography” and describes it as “as a combination of street photography and portrait photography.” In essence, it involves the photographer visibly loitering in a specific, clearly identifiable location, taking candid surreptitious photographs of ordinary people engaged in an ordinary situation. Getting on an elevator, for example, or passing through a subway turnstile. New York photographer Bill Sullivan has compared his photographic approach to wildlife photography. He establishes a likely location, waits until the subject arrives, takes the photograph. Instead of deer or rare bird species or crocodiles, Sullivan photographs people in their natural environment. Sullivan’s subway turnstile series is entitled “More Turns.” He stood outside the turnstile, thumbing through a magazine as if waiting for somebody, his digital camera concealed. When the subject pushed the turnstile bar, he snapped the shutter. In this series, almost all the subjects are looking directly (if fleetingly) at Sullivan. There is an unspoken acknowledgment of a covert and simultaneous connection between the photographer and the subject…the subject sneaks a look at the photographer (who is pretending not to be paying attention) and the photographer sneaks a photograph of the subject. Sullivan acknowledges there are ethical issues involved in this situation. “[W]hen I tell what people what I do – taking pictures from up close with a camera that is not seen…they often look at me with a lot of suspicion, if not fear, and even disgust.” He contends that this reaction has as much to do with time and distance as it does with ethics. The people who react so strongly against the photos, he states, would probably not do so if the photographs had been taken fifty years ago or in a different cultural setting. If the photographs were of aboriginal peoples in aboriginal settings, he claims, the reaction would not be the same. Sullivan’s situational photography was inspired, in part, by the work of August Sander. In addition to his occupational photography, Sander also had a portfolio simply entitled “People Who Came to My Door.” During the post-war depression, beggars and people looking to work for food would knock on Sanders’ door; he would take their photograph, always framed by the doorway. 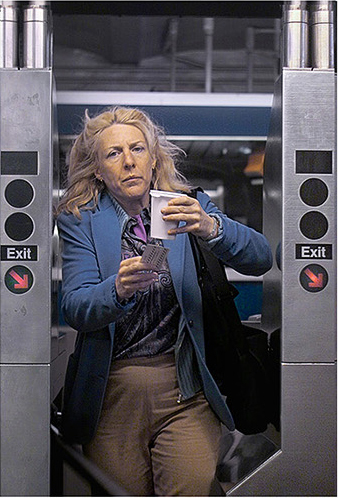 Sullivan’s situational photograph series all share a similar framing concept…the turnstile. “I became a spy for the obvious,” Sullivan says. It’s an accurate description of his approach to taking the photographs. But it says nothing about the photographs themselves. In the turnstile series, we see everyday faces in unstudied and revealing moments…they’re photographed at a moment when they feel entirely unobserved. In contrast, his elevator series (entitled “Stop Down”) the photographs were taken in exactly the same surreptitious manner, but elevator behavior is radically different from subway behavior. In elevators we have people in an enclosed space who are deliberately NOT looking at each other. The result is a profoundly different sort of portrait. Sullivan is fond of quoting a comment made by another controversial street photographer, Philip-Lorca diCorcia. “Photography is a foreign language that everybody thinks they know how to speak.” That’s certainly true of Bill Sullivan’s work. It appears simple, but the simplicity is only on the surface.